Visitors are welcome to tour the hatchery, to fish in the East Fork which runs through hatchery grounds, or to picnic in areas provided for the public. 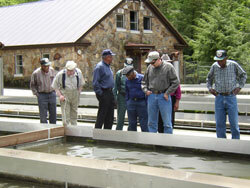 Special group tours can be arranged by calling the hatchery. Group tours would include scouting groups, church groups, schools, or other organizations. Visits by individuals and families are generally on a walk-through basis. Please feel free to ask our hatchery employees any questions that you may have. The best time of year to schedule group tours is in the fall. At this time, you will be able to see more stages in the life cycle of trout, particularly the eggs and sac fry. It may be possible to schedule a time during the spawning of brood fish. Generally, hatchery hours are from 8:00 AM until 4:00 PM daily. There may be a few exceptions during the winter months if inclement weather makes conditions unsafe for visitation. The hatchery is closed Christmas Day.